A unique poster listing the name of the venue will be sold at each show. Posters will be limited to several hundred per show and they should become highly collectible. People from 141 countries have visited Bob Links. KBCO presale tickets will go on sale through Ticketmaster on Thursday, May 15 at 10:00 AM. Tickets will go on sale through Smith's TIX on Saturday, June 14 at 11:00 AM. Tickets will go on sale through Ticketweb.com on Saturday, June 7 at 10:00 AM for the 3 show summer concert series. Tickets for the single show on July 21 will go on sale on June 14. Tickets will go on sale through ICTickets.com on Monday, June 9 at 10:00 AM. Tickets will go on sale through Tickets.com on Sunday, April 27 at 12:00 noon. Bob will open for the Dead and sit in with the Dead during part of their show. Bob will share the bill with Tom Petty and the Heartbreakers. Bob will open this show. 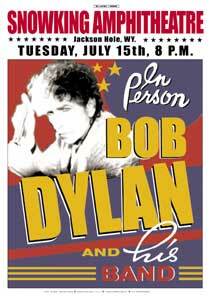 Bob will share the bill with Tom Petty and the Heartbreakers. Tom will open this show. Address: 311 W. 34th St.
available to the public for a Bob Dylan show. Click here to bid. The show has been cancelled and rescheduled for Friday, August 15. Refunds will also be available at the point of purchase. All tickets from the cancelled August 14 show will be honored on this date. The August 15 show has been cancelled. next 10 days if Bob's people are able to work it into their schedule. An announcement may come on Monday, August 18. Address: 95 South Turnpike Rd. Tickets will go on sale at the Northampton Box Office on Friday, July 11 at 10:00 AM. This is a reschedule date for the August 14 show. All tickets from the August 14 show will be honored on this date. Tickets will go on sale by phone and at the box office on Saturday, May 17 at 11:00 AM. Address: 581 State Fair Blvd. Two free tickets when you buy a hotel package at participating hotels. Tickets will go on sale through www.eventim.de on Saturday, July 26. Ticket prices: 3995, 2995, 1995, 995, 795 Kc (reserved); 595 Kc (standing). Tickets will go on sale through ticketline.co.uk on Friday, August 1 at 9:00 AM. General admission tickets will go on sale through Ticketmaster Ireland on Friday, August 1. Reserve tickets will go on sale through Ticketmaster Ireland on Thursday, August 7 at 9:00 AM. The show sold out in 90 minutes. Bob has viral laryngitis. The show has been cancelled and cannot be rescheduled. Tickets will go on sale through www.stargreen.com on Friday, October 10 at 9:00 AM. Tickets will go on sale through ticketmaster.co.uk on Friday, September 12 at 9:00 AM. Tickets will also go on sale through www.ticketweb.co.uk on Friday, September 12 at 9:00 AM. Tickets will go on sale through www.stargreen.com on Friday, September 12 at 9:00 AM. Tickets will go on sale through ticketline.co.uk on Friday, September 12 at 9:00 AM. Tickets will also go on sale through www.stargreen.com on Friday, September 12 at 9:00 AM. Tickets will also go on sale through ticketline.co.uk on Friday, September 12 at 9:00 AM.